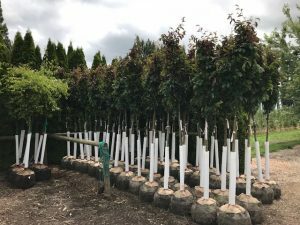 Urban Forest Nursery, Inc. is a wholesale tree nursery located in the beautiful Skagit Valley of Washington State. The company specializes in high quality street and landscape trees; primarily selling to city planners, landscape contractors, and housing developers. Jim & Annie Barborinas, owners of UFN, Inc., began growing trees in 1995, starting with a small rented field just a few miles from the current nursery. There are now 32 planted acres with over 180 varieties! At Urban Forest Nursery, Inc. trees are specifically selected and grown for characteristics that complement the limited planting spaces and adverse conditions typical of urban planting sites today. From Jim’s knowledge of growing trees, he is particularly adamant about soil preparation and proper tree selection regarding location, installation and maintenance. UFN, Inc. trees are sold to brokers and contractors, but also directly to the cities of Seattle, Tacoma, Olympia, Bellevue, Everett, Mount Vernon, Bellingham, Hoquiam, and others. Trees are also shipped to British Columbia and Alaska. The knowledge and experience of growing hundreds of old and new varieties, provides Jim with valuable information when selecting, planting and maintaining these trees in the landscape. He encourages anyone in the industry to take time to visit the nursery, learn more about the multiple varieties available and understand the importance of diversity of their use in the landscape. Loading Trees at Urban Forest Nursery Inc.
Digging Trees at Urban Forest Nursery Inc.
Growbags make it possible for us to harvest the trees here at Urban Forest Nursery Inc. quickly and efficiently. Because the majority of roots remain in the grow bag, and only smaller absorbing roots grow into the surrounding soil, the nursery can dig year round, and in almost any kind of weather - including deep snow! When the trees are unearthed, the majority of roots remain in the bag. Please click HERE to sign up for updates on our latest inventory availability.